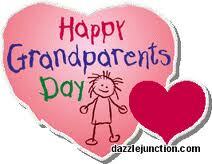 I hate to admit that when my children were young, I ignored Grandparents Day. In fact, I thought that designated Sunday in September was probably a day that Hallmark and other greeting card companies created to sell more cards. I may have encouraged my children to say, “Happy Grandparents Day!” to their grandparents, but that was it. I was wrong. Recently, I researched and learned that in 1970, a West Virginia housewife, Marian McQuade, initiated a campaign to set aside this special day. Throughout her life, she was an advocate for the elderly, especially shut-ins and those in nursing homes, and she wanted a day to publicly honor this generation. With the help of civic groups, businesses, churches, and political leaders, her campaign for Grandparents Day went statewide. The first Grandparents Day was proclaimed in 1973 in West Virginia, and that state’s senator introduced a Grandparents Day resolution in the United States Senate. Then Mrs. McQuade and her team contacted governors, senators, and congressmen in every state. They gained the support of national organizations interested in senior citizens, as well as churches and businesses. In 1978, the United States Congress passed legislation proclaiming the first Sunday after Labor Day as National Grandparents Day, and President Jimmy Carter signed the proclamation. September was chosen for the holiday, to signify the “autumn years” of life. And I learned that Mrs. McQuade and her committee set three purposes for this day. One as I expected: to honor grandparents. Another, to give grandparents an opportunity to show love for their children’s children. And finally, to help children become aware of the strength, information, and guidance older people can offer. To me, these purposes say that Grandparents Day is about making memories. The official Grandparents Day website, http://www.grandparents-day.com, even suggests activities to strengthen the bond among three generations. Grandparents can share stories of the past, telling about “the old days.” Then the door for children, both adult parents and grandchildren, to ask questions is open. Look at photos together and label the pictures with details of who, when, and where. Play games and sing songs that grandparents played and sang when they were young. Construct a family tree so that children see the names of their ancestors. I like when I’m wrong and right is right. The creation of Grandparents Day was about talking and sharing and playing and singing. On Sunday, September 8, I plan to share pictures of my Grands’ parents when they were young, and tell my Grands about the day a pet guinea pig hid behind the refrigerator. We’ll play a family game of ‘Button, Button, Who’s Got the Button?’ And I’m sure my Grands will be glad they weren’t named after either of my grandmothers – Gladys and Etta Juda.